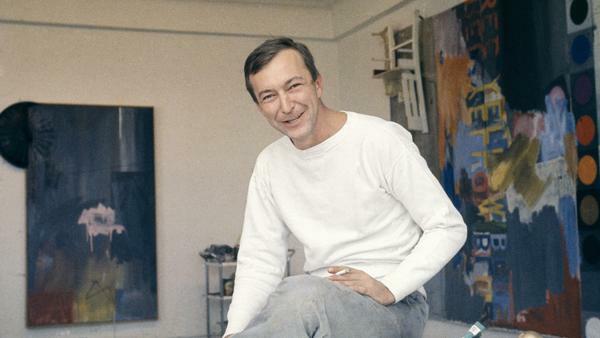 Jasper Johns, pictured in his New York City studio in 1964, was known for transforming common objects like flags, numerals and archery targets into unsettling paintings. As exhibited at The Broad, Jasper Johns' "Flags" from 1965 (center-left) sits next to "Ventriloquist" from 1983. Pablo Enriquez / Art © Jasper Johns/Licensed by VAGA, New York, N.Y.
Jasper Johns, "Three Flags" from 1958. Robert Gerhardt and Denis Y. Sus / Whitney Museum of American Art. 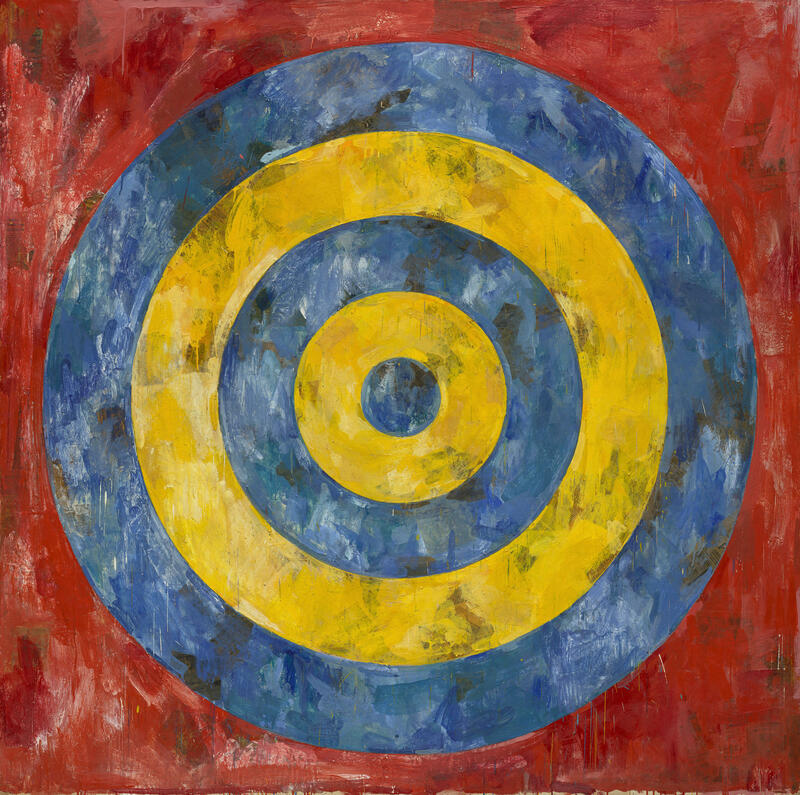 © Jasper Johns / Licensed by VAGA, New York, N.Y..
Jasper Johns, "Target" from 1961. The Art Institute Of Chicago © Jasper Johns / Licensed by VAGA, New York, NY. Jasper Johns, "Untitled" from 1975. 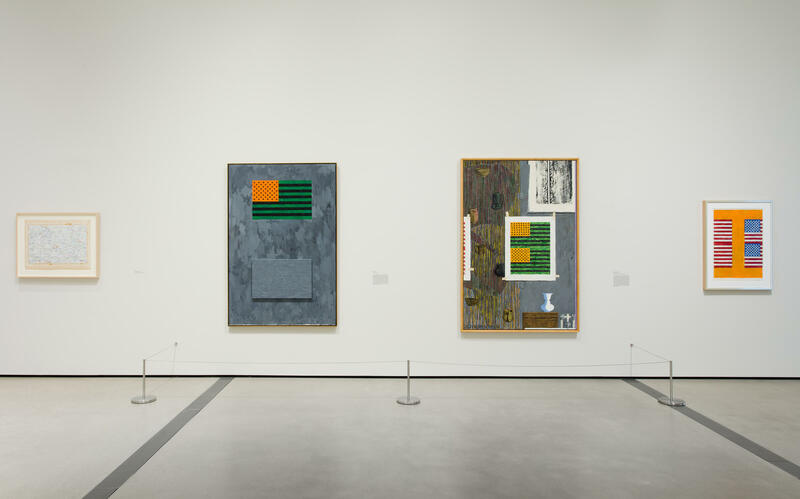 Douglas M. Parker Studio / The Eli and Edythe L. Broad Collection © Jasper Johns / Licensed by VAGA, New York, N.Y..
A guide at the Jasper Johns exhibition at The Broad museum in Los Angeles smiles. Then she urges: "Go look at that one." Brianna MacGillivray points at "Flags," from 1965. The painting is enigmatic, yet direct — much like the artist. He's painted two rectangles on a gray background. The top one has black stars against an orange background; the stripes are black and green. There's a tiny white dot on one of the green stripes. Below this rectangle is another one, all gray. "It's kind of like an optical illusion, where you see colors that aren't really there," MacGillivray says. "If you focus your eyes on the dot, you start to see red and blue on the flag that's painted in grey below." Green and red are complementary colors; so are orange and blue. Look at green and orange long enough and you see red stripes and a blue field of white stars. Really! Ed Schad is co-curator of the exhibition — a collaboration with the Royal Academy of Arts in London. "I actually love it because it produces a flag that, for all intents and purposes, is not there," he says. "I think it was a way to take something that we're already emotional about and get into how we see it," Schad says. Viewers do have emotional reactions to the American flag. Some feel patriotic, or proud, angry, nostalgic. Here's what Jasper Johns once said about his flag paintings. "One night I dreamed I painted a large American flag," he said. "And then the next morning I got up and went out and bought materials to begin it." The materials included paint, of course. But there was also melted wax, into which he mixed color pigments (a technique called encaustic), and strips of newspaper. His stripes are bumpy, dimensional. It's a painting, but also sculptural. The Broad's director, Joanne Heyler, says that this was original, on Johns' part. It was a challenge to the ropes and splatters of paint that Jackson Pollock and the abstract expressionists had done. Johns was making something new: recognizable, but different. And in Johns' hands, flags — sacred objects to many — are a bit off-putting, intentionally. He paints, in his words, "things the mind already knows" and makes us see them differently. "Trying to take you off your guard a little bit as a viewer — slow down and look in a new way," Heyler says. Take his Numbers series: big Arabic numerals — different numbers, different colors, different combinations, different mediums — made over six decades. The motivation? Hard to tell. Jasper Johns, age 87 now, doesn't like talking about his work. But in 1964, he jotted this in a notebook: "Take an object / Do something to it / Do something else to it. [Repeat.]" Which pretty much sums up his artistic philosophy! "He is a master of understatement in a way," Heyler says. "But you know, his directness, also kind of like his paintings of American flags, also contains a great deal of complexity." So do his Target paintings. That is, archery targets. Concentric circles in various color combinations — blue, yellow and red; or just blue and yellow; or all white. That last one is actually gorgeous — very textured and layered — and un-nerving. "Because what's going on here?" says curator Ed Schad. "Are you trying to hit the target? Is someone standing behind you? Are you in the way of someone out in the world that's trying to hit the target?" A target can make a viewer nervous — scared. "I think that that would be a just reading," Schad responds. "There was a critic, unfortunately I can't remember who it was, but they said something equivalent: 'Jasper Johns can make you feel uncomfortable in your own kitchen.'" Which may explain why they linger in the mind. The flags and targets provoke reactions. 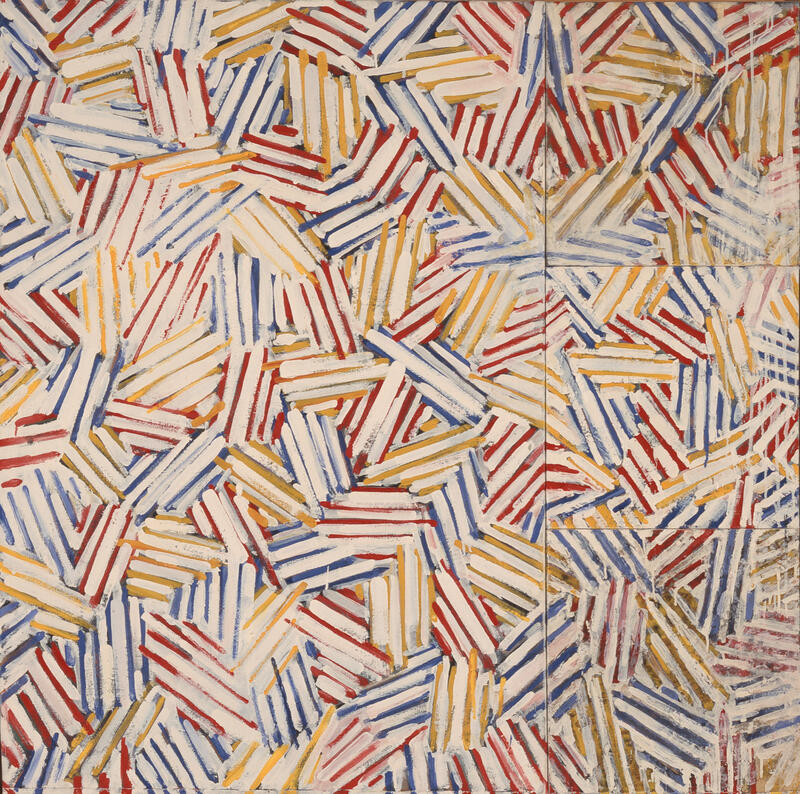 Jasper Johns' later work — and there's lots of it in this exhibition — is often more abstract, with rich colors. Especially glorious is the art he made while he and the late, great artist Robert Rauschenberg were lovers in the 1950s. Their break-up turns Johns canvases gray for a while. Then he finds color again, and new obsessions and explorations. Is he still painting flags? Heyler, The Broad's director, says: "Who knows." All right. I want you to consider these objects - an American flag, a target and a number. Would you ever think to make paintings of them? Well, the American artist Jasper Johns did that. And now six decades of his work are on view at The Broad museum here in Los Angeles. Johns was first known for getting us to look at ordinary objects and to see them in new ways. This exhibition, though, goes beyond those early works to show his various preoccupations over the years. NPR's special correspondent Susan Stamberg couldn't get past the first paintings, though, and why and how exactly they are art. SUSAN STAMBERG, BYLINE: Go look at that one, a guide in the gallery said. BRIANNA MACGILLIVRAY: It's kind of like an optical illusion, where you see colors that aren't really there. STAMBERG: Brianna MacGillivray points at Jasper Johns "Flags," 1965. The painting is enigmatic yet direct, much like the artist - two rectangles on a gray background. The top one has black stars on an orange field. The stripes are black and green. There's a tiny white dot on one of the green stripes. Underneath this rectangle is another one, all gray. MACGILLIVRAY: If you focus your eyes on the dots, you start to see red and blue on the flag that's painted in gray below. STAMBERG: Looking at that white dot? STAMBERG: I see the red (laughter). STAMBERG: Green and red are complimentary colors. So are orange and blue. Look at green and orange long enough, and you see red stripes and a blue field of white stars - really. ED SCHAD: I actually love it because it produces a flag that, for all intents and purposes, is not there. STAMBERG: Ed Schad, co-curator of the Jasper Johns show, a collaboration with the Royal Academy of Arts, London. What was it with him and flags? SCHAD: I think it was a way to take something that we're already emotional about and get into how we see it. STAMBERG: Johns did some 40 flag paintings, the first when he was 24. It put him on the road to fame. Some years ago, a flag painting went for $36 million. And, you know, flags do make us emotional. We feel patriotic, proud, angry, nostalgic. Here's what Jasper Johns said about his flag paintings. 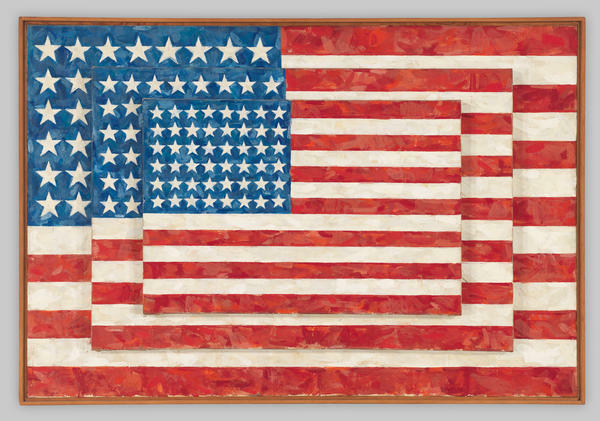 JASPER JOHNS: One night, I dreamed I painted a large American flag. And the next morning, I got up. And I went out and bought materials to begin it. STAMBERG: Paints, melted wax into which he mixes color pigments - it's called encaustic - strips of newspaper. His stripes are bumpy, dimensional. JOANNE HEYLER: It's both painting and sculpture. STAMBERG: Joanne Heyler is director of The Broad. This was original, she says, and a challenge to the ropes and splatters of paint that Jackson Pollock and the abstract expressionists had done. Johns was making something new - recognizable but different. And flags, sacred objects to many, in John's hands are a bit off-putting, intentionally. HEYLER: Trying to take you off your guard a little bit as a viewer, slow down and look in a new way. STAMBERG: He paints, in his words, things the mind already knows, and makes us see them in new ways - like his Numbers series - big, Arabic numerals, different numbers, different colors, different combinations and different mediums made over six decades. The motivation? - well, Jasper Johns, age 87 now, doesn't like talking about his work. But in the 1960s, he jotted this in a notebook. HEYLER: (Reading) Take an object. Do something to it. Do something else. STAMBERG: Which pretty much sums up his artistic philosophy. HEYLER: He is a master of understatement, in a way. But, you know, his directness also, kind of like his paintings of American flags, also contains a great deal of complexity. STAMBERG: So do his target paintings - archery targets, concentric circles in various color combinations - blue, yellow and red or just blue and yellow or all white. It's actually gorgeous, very textured and layered and unnerving. SCHAD: Because what's going on here? Are you trying to hit the target? Is someone standing behind you? Are you in the way of someone out in the world that's trying to hit the target? STAMBERG: My feeling about targets when I see them is nervousness. They make me scared. SCHAD: I think that that would be a just reading. There was a critic - unfortunately, I can't remember who it was. But they said something; the equivalent is, Jasper Johns can make you feel uncomfortable in your own kitchen. STAMBERG: Well, yeah, that's why they linger in the mind. The flags, the targets provoke reactions. His later work - and there's lots of it in this exhibition - is often glorious. It's more abstract, rich colors, especially the art he made while he and the late, great artist Robert Rauschenberg were lovers. Their breakup turns Johns' canvases gray for a while. Then he finds color again and new obsessions and explorations. Is he still painting flags? STAMBERG: At The Broad museum in Los Angeles, I'm Susan Stamberg, NPR News. 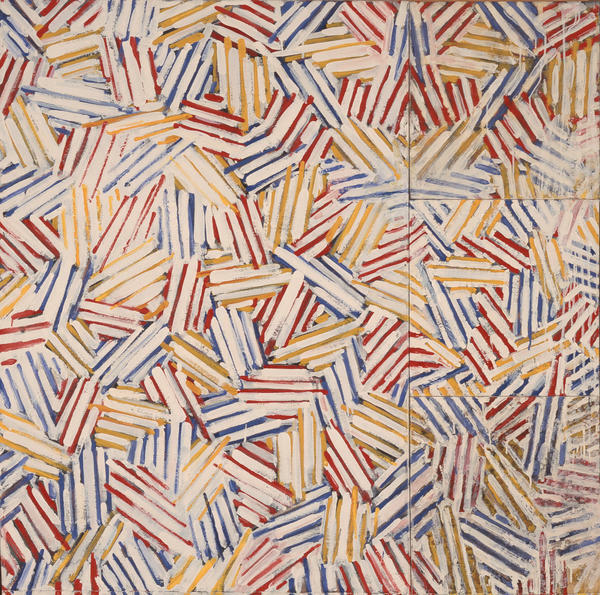 SCHOOL OF YULE: (Singing) Jasper Johns, the American artist, did paintings composed of simple motifs. Motifs are recurring ideas in artwork. Transcript provided by NPR, Copyright NPR.